Architectural applications and demanding constructions require extended 3D engineering as well as in-depth manufacturing experience and expertise. VETA’s experienced engineering team has realized a wide range of demanding architectural projects which vary from interior staircases to metal cladding for buildings, facades and light weight structures. VETA's Perforated Metal Software offers a new market opportunity in Sheet Metal Projects. 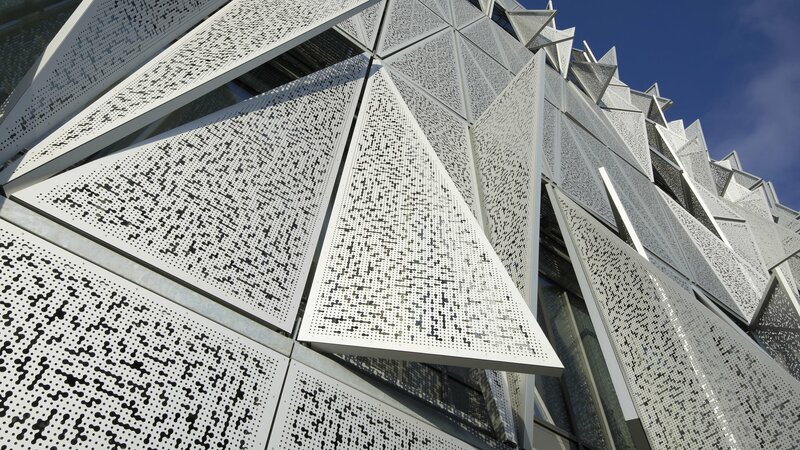 Incorporating precision-perforated metals within building facades allows architects not only to create unique decorative designs and aesthetic effects, but also offer practical solutions for issues such as solar shading and sound management. As part of a lightweight cladding system, perforated materials can be used to provide more pleasant internal environments and reduce energy consumption by allowing natural ventilation and day lighting to enter while shading spaces from direct sunlight. They can also improve building security, or be combined with sound-absorbing material to enhance acoustic performance.